First of all... I am a huge proponent of County Fairs, as they promote the understanding of agriculture and it's effects on our environment and health at large. That and my dad's department is in charge of the LA County Fair. Pretty much everything that's consumed at County Fairs are things you could easily find on This is why you're fat. Here are some highlights. Amazing. Simply one word. My favorite thing at the County Fair. At $5 I could easily make this at home. So alas we did not try, but for anyone not crafty enough (or adventurous enough) you can buy this delectable delight at the county fair. 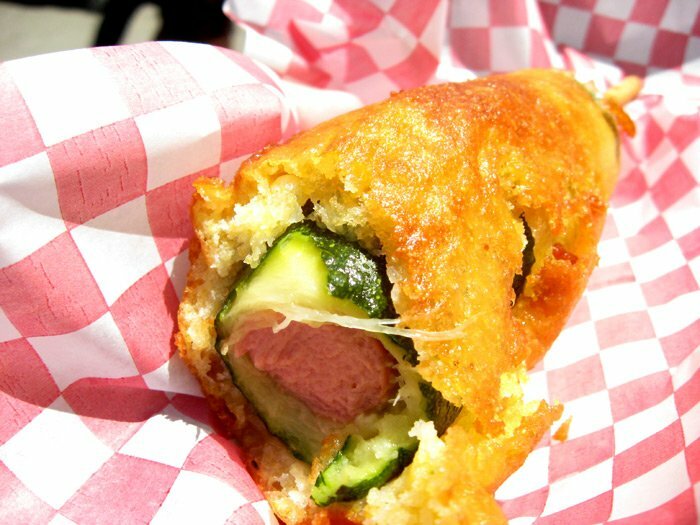 A zucchini that's been hollowed out, hot dog inserted, dipped in batter and been deep fried. Plus I just love the name! Because you can get almost anything deep fried at a county fair. Always a fan favorite, as big as your head I'm impressed P actually finished hers. Yes, you read that right. And the best part? 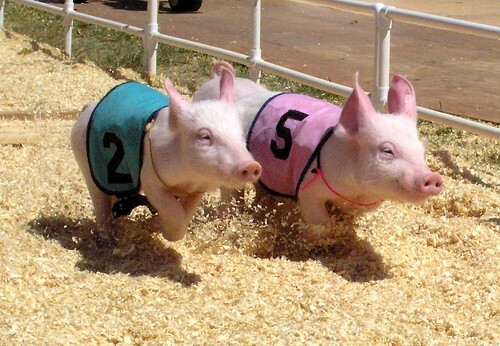 It's sponsored by good o'le Ralphs, so after you watch the adorable mini Babes race around the track, you can get coupons for free bacon to complete your experience. By "exhibits" they mean shopping! That's right, you can find everything you ever wanted from a late night infomercial (including the Sham Wow Man) at the County Fair. They even do pretty impressive knife demonstrations. I won't even go into these. But picture every "high school fair" especially the one at the end of Grease and all those rides and games and you can find them here. Sing a little "You're the one that I want" while going through a fun house, or ride the huge ferris wheel, but just make sure to part-take BEFORE hitting the food booths. Perhaps the best part, they sample all of their favorite wines in a fun and enlightening environment. Granted it is a little pricey, after a few glasses you won't care anymore. seriously could n.o.t. look at food the rest of the day. Android is a best operating atavist.com/ system today to enjoy video clips, Check this Website films, games and so on whatever Game Killer Download – PC, Android, iPhone & APK Free you want you can enjoy on android mobile since there is Game Killer Download every type of application offered Game Killer for android mobile on Google play store. that enjoy to obtain outside as well jigsy.com/ as obtain relocating, even off the Title ruined path.It weighers and also a little Ideal Infant Jogging Stroller In 2017-- Guide & Review bit unwieldy. GP says, At around pounds and also inches.